1. Use your food processor to chop the two cups of dates until they're sticky and grainy - you should be able to easily roll them up into balls! 2. Use your food processor to chop up your almonds - just pulse them a few times, you still want good size chunks. 3. Add the dates and almonds to a large mixing bowl. 4. 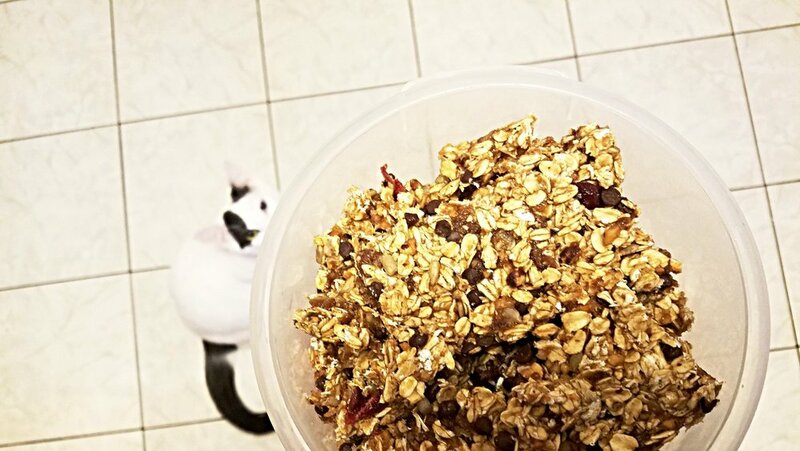 Add your oats to the bowl. 5. Heat the sunflower seed butter and maple syrup in the sauce pan over low heat. 6. Continuously stir the syrup mixture until thoroughly combined. 7. Remove the pan from the heat and pour over your oatmeal mixture. 8. Use a wooden spoon to mix your oatmeal combination until thoroughly combined. 9. Fold in your chocolate chips, sunflower seeds and cranberries. 10. Line a 9"x13" baking pan with parchment paper. 11. Spoon your mixture into the baking pan and press down evenly. 12. Store your granola bars in the refrigerator for an hour. 13. Take your pan out of the refrigerator and cut granola bars into 16 pieces. *You can keep the granola bars in the fridge or on the counter for up to a week, or you can store them in the freezer for months!